America is the land of the free, home of the brave… the white picket fences, the 2.5 kids in every “modern family.” Or so we’ve been led to believe. In the current age, America and democracy are synonymous. Little do most Americans know they don’t actually live in a democracy. America was actually founded as a Constitutional Republic, as stated in the Constitution and the Pledge of Allegiance. In an Economist ranking of the world’s democratic countries in 2006, America didn’t even crack the top 10. This is both true and false. A large number of the Founding Fathers were associated with various sects of the Christian church, like Protestantism and Lutheranism. However, many still openly opposed organized religion. Thomas Jefferson practiced Deism, which contends that reason and observation of the natural world are enough to determine the universe has a creator without the need for organized religion. While it’s true that the occasion we now know as Thanksgiving first occurred between Pilgrims and nearby Indians, it originally was three days long and served to salute the annual harvest. (Imagine our modern version of stuffing and turkeys for three days.) For the Pilgrims, Thanksgiving was intended to be a religious holiday of fasting and prayer, but only turned to a feast after the rains came during one such period in 1623. There is a general belief that we can walk anywhere, rest anywhere or do whatever we need to do to survive. Tell that to the homeless. Although courts struck down laws against vagrancy years ago, sleeping on the streets or in public parks is still illegal, as is hitchhiking, panhandling and other “freebies” broke people need to survive. And there are countless laws and ordinances designed to give police officers probable cause to violate our freedoms. In June 2011, a woman in Rochester, New York was arrested simply for filming a traffic stop from her front lawn, proving that we aren’t free — even if we stay in our yards. The Fed conducts the nation’s monetary policy, but faces no regulation from the government aside from the appointment of its President and Board of Governors. Otherwise, the central bank can do what it pleases. 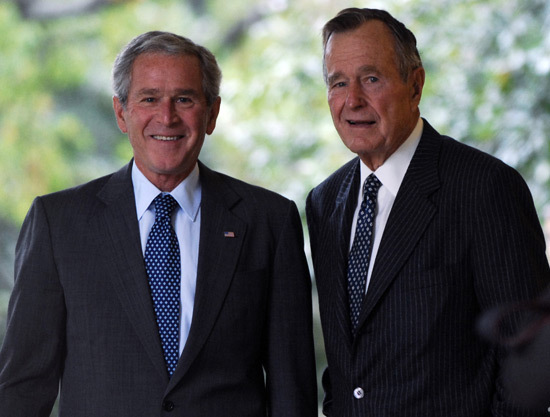 Despite deep ties to the Texas oil business, including failed ventures from G.W., the roots of the Bush family are about as Texan as, say, Connecticut. The Bush’s are a northeast elite banking family, whose lineage extends back to the British crown. W’s grandfather Prescott Bush was a member of Yale’s elite Skull and Bones secret society, as were Bush, Sr. and W. himself. Prescott went on to unfathomable Wall Street riches and infamy, after he was tried and charged with money laundering for the Nazis during WWII. The “Columbus discovered America” myth doesn’t seem to be dying off. For starters, Native Americans occupied the territory for centuries before his arrival. But the Scandinavians were also here previously: their Vikings were known to have landed 500 years before Columbus did, yet Columbus gets the credit as the man who discovered America during his Spanish Empire-financed voyage in search of gold. Based on the broken shackles at its feet and the politics of its creator, it comes as little surprise that rumors have built up that the Statue of Liberty is a tribute to the end of slavery. Frederic Bartholdi’s statue has given the National Office of Parks and Recreations second thoughts in the past couple of years, and the department has conducted a thorough investigation. They found the rumor of slavery was based on a single marketing pamphlet by Bartholdi, which they deemed to be false, but they did find that it is most likely true that Lady Liberty was modeled from the body of an African woman. Bartholdi had studied African women for a prior commission on an Egyptian statue, but when that project was scrapped, the studies became the foundation for the green Lady. Not to diminish Jackie Robinson or Rosa Parks, but just as Parks wasn’t the first black person to refuse to move her seat, Robinson didn’t break the baseball color code. In fact, blacks and whites briefly played professional baseball together in 1878 and 1879. In 1916, Jimmy Claxton, passing as a Native American, played a week until his black roots were found out, ending his contract forthwith. Then in 1945, while men of all sorts of ethnic backgrounds were dying beside each other in WWII, Happy Chandler, the new baseball commissioner, supported the signing of Jackie Robinson to the Brooklyn Dodgers. Robinson was called up to play in 1947, the same year Larry Doby, another black American and hall of famer, played for the Cleveland Indians. Sarah Palin’s recent flub brought attention to this inexhaustible myth. While her retelling of history was creative, the truth of the matter is that the wealthy silversmith and organizer of the “alarm system” set to warn of British invasion, Revere, was tipped off by Joseph Warren that British troops were heading after Samuel Adams and John Hancock. Revere set out and informed every messenger and rider he could about the movement. By the end of the night, it’s figured nearly 40 men were sending out similar warnings by the time Revere crossed the Charles and warned every home in Charlestown of the British arrival. According to local sources, secrecy needed to be maintained and so Revere actually yelling, “The British are coming” would have been ill-advised, so the more stealthy “The Regulars are coming out” was used. Dan Quayle, the VP under President Bush Sr., never seemed to shake his image of a dunce following a much publicized misspelling of the word “potato” to a group of elementary school students in New Jersey. The truth of the matter is, the spelling card Quayle held, and was assured had been checked, was wrong, adding an “e” to the end of the word. The incident seriously damaged the Bush-Quayle presidential ticket and Clinton-Gore went on to win the election. 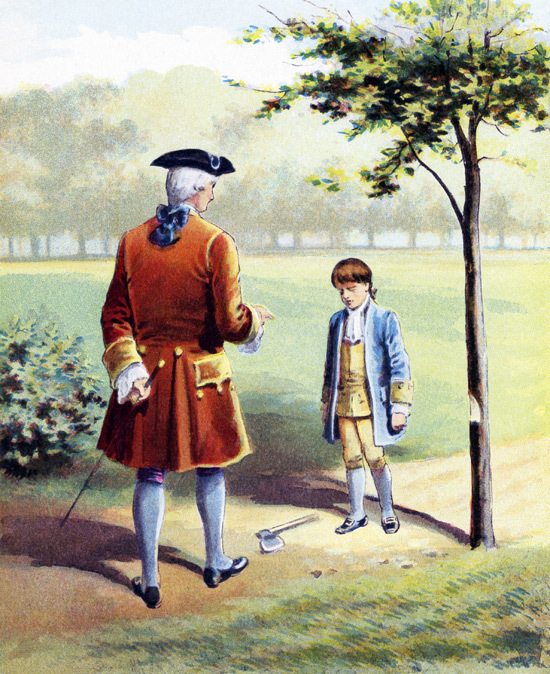 According to UVA scholars, Washington chopping down his Cherry Tree is pure myth, an attempt to construct a legend around the nation’s first President after Washington’s initial biography painted him as “cold and colorless.” The moral of the Cherry Tree story was Washington’s humility and honesty, a fable attributed to the leader’s refusal to continue serving, thus contradicting the grab for power and tyranny from which the nation had just escaped. According to numerous studies, America’s incarceration rate is the highest in the world, topping 743 per 100,000 persons, with more than 2.2 million behind bars as of 2011. Scary still, one out of every 143 adults and one in 111 African-Americans are behind bars. (Meanwhile, racial profiling is rampant across the country, to the extent that everyone from Congressional Democrats to former President George W. Bush have called it unconstitutional and just plain “wrong.”) With so many behind bars, it’s not possible that all of these people are serious thugs.